A large specimen grown in the Reunion island. Origin and Habitat: North Nigeria, Tanzania, Uganda and across sub-Sahara Africa to the Horn of Africa and East Africa (Djibouti, Eritrea, Ethiopia and Somalia). Yemen. Altitude range: 0–1500(-1700) metres above sea level. Habitat and ecology: Adenia venenata is a fairly common climber that grows in the savanna, in deciduous bushland or -woodland and in open stony scrub on a variety of soils; sand, clay, volcanic basalt or limestone. In Africa it is sometimes found planted near villages, because of its medicinal properties. 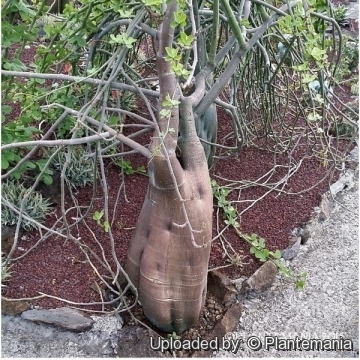 Description: Adenia venenata is a semi-succulent, almost tree-like creeper or climber plant 1-8 m high. It produces a bottle-shaped swollen lower trunk with few to many glabrous glaucous twining branches arising from its top which ascends high into trees. 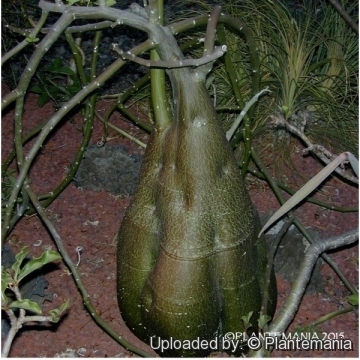 It is one of the most remarkable pachypodous species in the genus. Stem: Base of main stem fleshy, somewhat elongated conical to cylindrically thickened to about 2m high and 60 cm across, with smooth greenish bark. Branches with grey-green, rope-like smooth bark. Twigs thin, pendent. Tendrils simple, up to 12 cm long. Leaves: Deciduous. Shallowly to deeply 3-5(-7)-lobed, base cordate, apex rounded, almost circular to ovate in outline, 1.5-12 cm long 1.5- 13 cm wide, grey to glaucous beneath, not punctate, 5-nerved from base. Petiole 1–8 cm long. Gland at blade-base single; glands on blade often present. Stipules narrowly triangular, 0.5–1 mm., withering. Fruit (capsule): 1–2 per inflorescence, ovoid-ellipsoid, with more or less acute apex, 2-4.5 cm long, 1.5-3 cm wide, leathery, conspicuously veined. Seeds: 15–35 per capsule, orbicular to broadly ovate narrowed at the top 4.5–6 mm long, with more or less acute apex. Notes: Adenia venenata Forssk., is the type species of Adenia, collected in Yemen, at Al Hadiyah [Hadle], on March 1763 by Pehr (Peter) Forsskal (1732-1763). 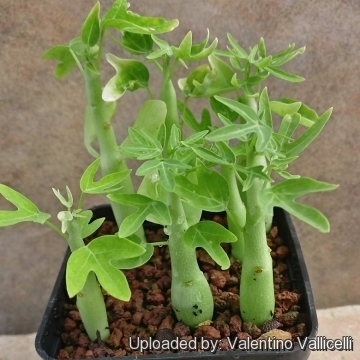 Cultivation and Propagation: Adenia venenata is quite easy to grow. 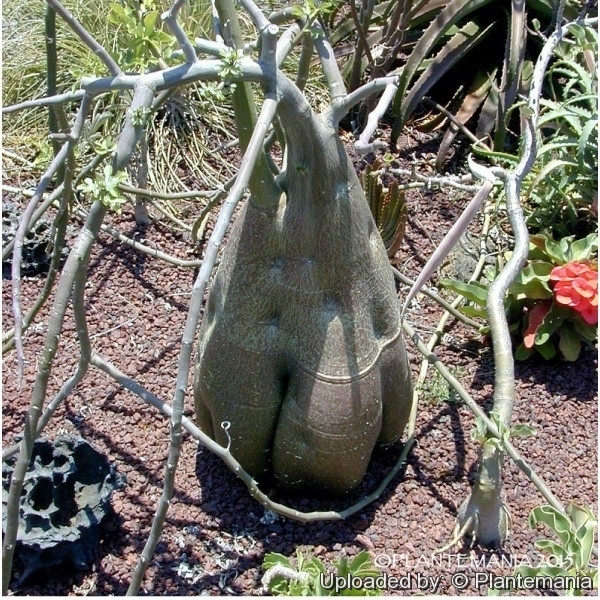 In pot it does not grow as in nature but you can still appreciate the bottle shaped caudex. Grow it in a large pot with a well draining mix. Water during the vegetative period by letting it dry well between one watering and the other. It requires intense light but protect it from blasting summer sun. It can be grown as a Bonsai .